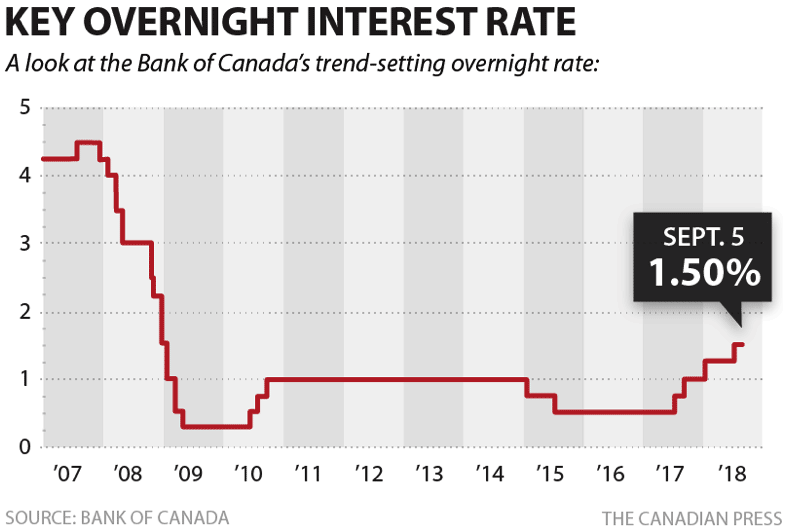 The Bank of Canada’s rate, known as the target or overnight rate, affects the interest rate borrowers and savers are offered from retail banks on savings accounts, mortgages, and other financial services. The Bank raises its rate when it wants to cool down a hot economy and lowers it when it wants to encourage the public to borrow money in a slow economy. A healthy economy sits at its greatest potential at a 2% inflation rate, the bank’s target. While Consumer Price Index (CPI) inflation is on the high side—sitting at 3%— the Bank of Canada decided to maintain its overnight rate at 1.5% in its September announcement. The reason? It believes the high CPI rate is temporary—brought on by a jump in the airfare component of the CPI—and should be back down to around 2% by early 2019. In addition, the Bank’s core measures of inflation are still sitting around 2%. That being said, there are signs inflation could increase in the not-too-distant future—forcing the Bank to raise rates to keep it in check. The Canadian economy is humming along—in line with the Bank’s forecast—and the US economy is particularly robust, thanks to strong consumer spending and business investment. On the flip side, the Bank says global trade tensions are a significant risk to the global outlook. While the Bank is paying close attention to NAFTA and other trade negotiations, and their potential impact on inflation, it admits change is in the air. “Recent data reinforce Governing Council’s assessment that higher interest rates will be warranted to achieve the inflation target. We will continue to take a gradual approach, guided by incoming data. In particular, the Bank continues to gauge the economy’s reaction to higher interest rates.” The Bank made a similar statement earlier this year before subsequent interest rate hikes. On another note, in its report the Bank also stated that “activity in the housing market is beginning to stabilize as households adjust to higher interest rates and changes in housing policies.” It is our opinion here as Calgary Mortgage Brokers that higher interest rates are imminent. The Bank of Canada will make its next interest rate announcement in mid-October. If you’re concerned about how this might affect your household, feel free to reach out. I’m always available to chat—and offer my professional advice.